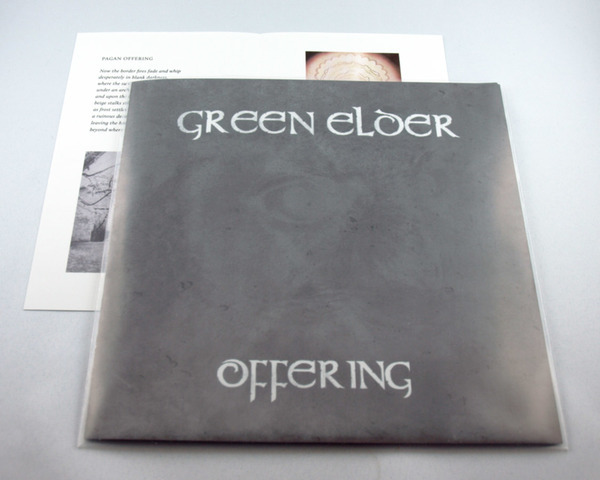 AOsmosis’ presents its first distributed title, the two-songs 7-inch “Offering” by neofolk duo Green Elder. It’s offered here in a special variant, accompanying the poem “Pagan Offering,” written by Zachary Corsa (Lost Trail, Look To The North, Pines) for this purpose. This edition is limited to a total of 20 numbered copies and only available through this store. Please take note that the poem print is still under progress, so the final version may differ from what is currently shown in the product photos. 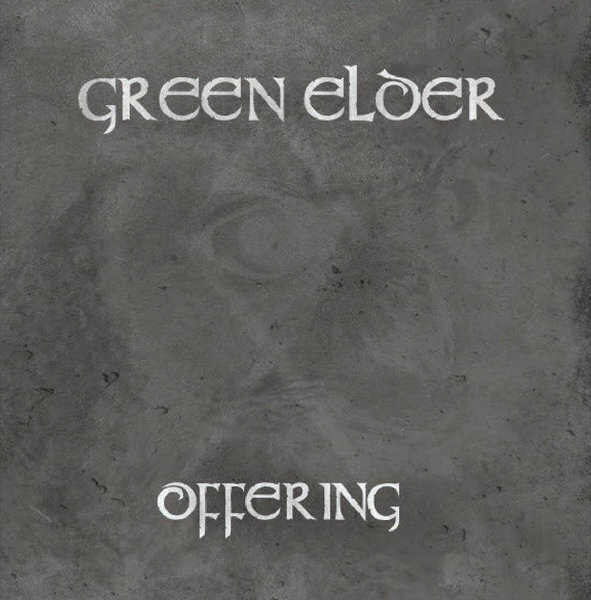 GREEN ELDER is a neofolk project that combines Appalachian, Celtic, and traditional influences. 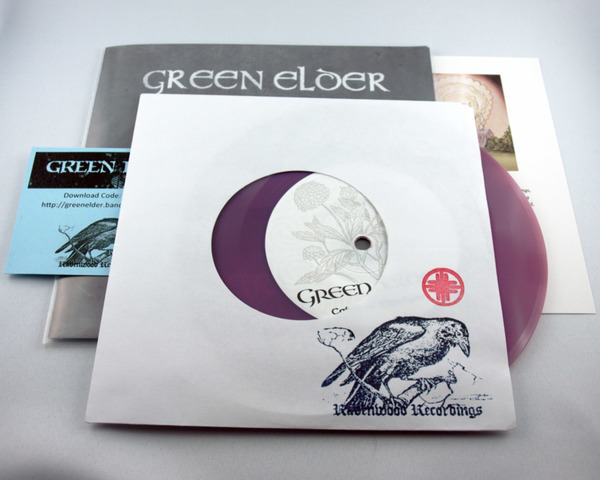 Green Elder is working to paint forests in sound, both by giving their natural seasonal beauty aural life and their mythical lore an abstract presence. Employing a DIY approach, each piece is carefully crafted by the artists themselves. 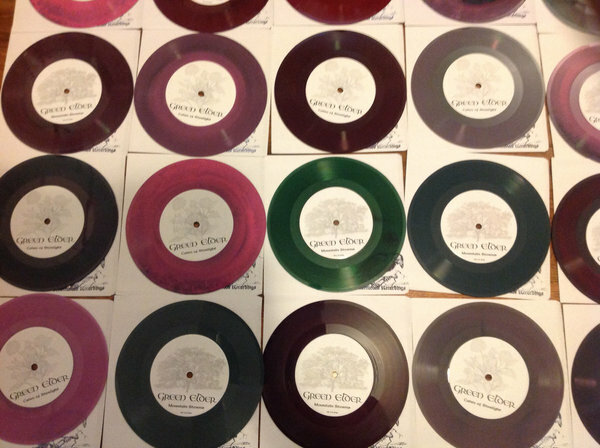 As shown in the 5th photo above each vinyl comes in a unique coloring that’ll be randomly selected for you. 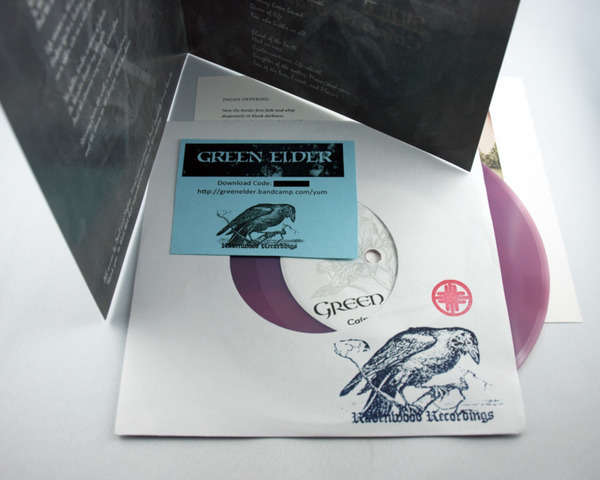 The inner paper sleeve was beautifully stamped by Green Elder. The poem print for the AOsmosis edition is a single-fold – the inner side features Corsa’s poem “Pagan Offering” as well as two images, while the back is individually xeroxed – similar to the pages of “You’re a Séance, Old North.” The print is hand-numbered, and stamped with the AOsmosis logo. Everything comes in a double-sided fold-over jacket (including the lyrics for both songs) within a protective sleeve. Bandcamp download code included. 250 copies in total. Different color for each vinyl. Poem print “Pagan Offering” limited to 20 hand-numbered copies; 4-page single-fold on ivory-colored paper.